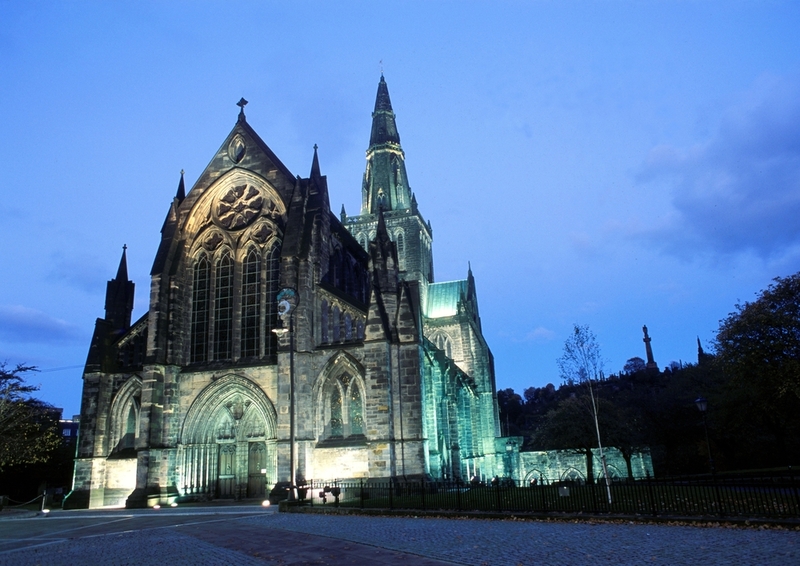 An attraction that shouldn’t be missed, Glasgow Cathedral has a rare timelessness. The dark, imposing interior conjures up medieval might and can send a shiver down the spine. It’s a shining example of pre-Reformation Gothic architecture, and the only mainland Scottish cathedral to have survived the Reformation. Most of the current building dates from the 15th century, and only the western towers were destroyed in the turmoil. The entry is through the side door into the nave, which is hung with some regimental colours. The wooden roof above has been restored many times since its original construction, but some of the timber dates from the 14th century; note the impressive shields. Many of the cathedral’s stunning, narrow windows of stained glass are modern, and to your left, is Francis Spear’s 1958 work The Creation, which fills the west window. The cathedral, divided by a late 5th century stone choir screen, is decorated with seven pairs of figures to represent the Seven Deadly Sins. Beyond is the choir. The four stained glass panels of the east window, depicting the apostles and also by Francis Spear, are particularly effective. At the north-eastern corner is the entrance to the 15th century upper chapter house, where Glasgow University was founded. It’s now used as a sacristy. The most interesting part of the cathedral is the lower church, is reached by a stairway. Its forest of pillars creates a powerful atmosphere around St Mungo’s tomb, the focus of a famous medieval pilgrimage that was believed to be as meritorious as a visit to Rome. Glasgow Cathedral is a must see on your tours of Scotland, contact us now at Ireland & Scotland Luxury Tours to organise your visit.